2019 must be the year of action! ESIP is focused on Data in Action: Increasing the Use and Value of Earth Science Data and Information, one of our strategic goals. Amazon has an entire series of blogs on Data in Action about their customers doing critical work in the cloud to support sustainability practices. EarthCube's All-Hands meeting will focus on Science in Action and next week's Research Data Alliance plenary will focus on “With Data Comes Responsibility.” USGS's Community for Data Integration will focus on “Big Data to Smart Data” and NOAA's Environmental Data Management Meeting will focus on “Unleashing NOAA's Data as a Strategic Asset for Science, Service, Stewardship and Innovation.” All of these seem to support Earth science data and information in action from the technical to the applied. If you have other ideas about data in action and how we can pursue that goal this year, please let me know by replying to this note. Raskin Scholarship applications are due on April 1. Please share with early career! See the full telecon calendar here. Select the meeting you'd like to attend, login instructions are included in description. 2019 Raskin Scholarship Deadline SOON – April 1st! In March 2012, the ESIP Federation lost long-time member, Rob Raskin. Rob was soft-spoken, easy-going, wise and an Earth science information partner extraordinaire. Rob was a mentor to many aspiring Earth science data professionals. In collaboration with Rob's family, the ESIP Federation and the Foundation for Earth Science remember Rob and his dedication to support the next generation of Earth science data and technology leaders through the Robert G. Raskin Scholarship. The Raskin Scholarship, which includes a $5000 award, as well as travel to and the opportunity to present at the next ESIP Meeting, is given annually to a current graduate, post-doc, or early career individual in the Earth or computer sciences who has an interest in community evolution of Earth science data systems. For more information, including how to apply, see here. 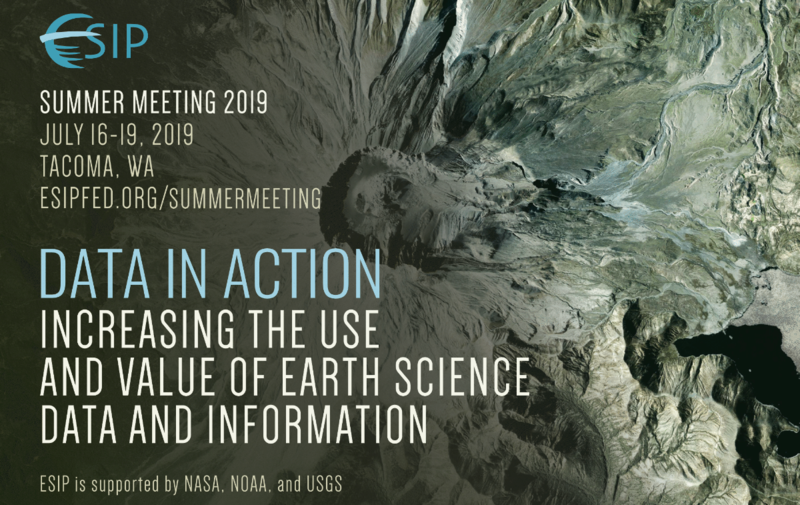 Did you miss the first installment of ESIP's 2019 Webinar Series ‘Data in Action: Increasing the Use and Value of Earth Science Data and Information' held last Friday? Don't worry. You can watch it here now on the ESIP YouTube Channel. See more about upcoming webinars here. The Spring 2019 Out2Lunch Webinar Series continues this week on Wednesday at 1 pm ET. To learn more and view previous webinars, see here. Highly interactive HTML5 teaching and training activities that allow users to explore physical processes such as tornadoes, air density effects on baseballs, past climates, rainbows, snowflake crystals (and more!) all on a computer screen. http://cimss.ssec.wisc.edu/wxfest/. ESIP Community Fellow and M.S. student, Rose Borden, shares takeaways from the 2018 Data Help Desk at AGU in this latest community fellow blog post. Along with Dr. Wade Bishop, Rose participated in the Data Help Desk in part to assess the level of satisfaction of Data Help Desk visitors and to identify potential improvements for future Data Help Desks to be hosted at AGU and elsewhere. You are invited to participate in a brief survey about the increasingly open use of data in science. Open, accessible, and high-quality data and related data products and software are critical to the integrity of published research – they are key to ensure transparency of research and to support reproducibility and new innovative applications. Unfortunately, only a small portion of research assets are shared, such that they can be understood by other researchers reading the publication, then subsequently be reused and repurposed in multiple other research endeavors. This survey is designed to help inform and advance progress on these issues. It is being shared by the American Geophysical Union, along with a set of partners, including ESIP, the Coalition for Publishing Data in Earth and Space Sciences (COPDESS), and Research Data Alliance (RDA). You can participate in the survey here by 3/27. The next in a series of workshops supporting information interoperability in the Earth and environment science community will be held at CSIRO Black Mountain (Canberra, Australia) on Thursday May 9th in association with the C3DIS 2019 conference. The Australian E2SIP collaborates with the US-based ESIP Federation to share technologies, practices, and conventions, and build the community of practitioners primarily from the research and government sectors. The workshop is structured around a series of breakouts on topics including drones, data management, and big data, and plenary sessions to set the scene and plan next steps. The detailed program can be previewed here. If you are interested in attending, please complete the form at this Eventbrite ticket link. The Environmental Data Initiative (EDI) invites you to participate in the continuing development of the Information Management Code Registry with a hackathon at UNM in Albuquerque, NM on Jun. 10-14th, 2019. The theme will be “Data Visualization for Assessing Data Fitness for Use.” Participants will collaboratively develop applications that will accept as input an EML document along with a dataset and provide visualizations of the data. The event organizers also aim to build a community that supports the idea of sharing code and enabling information managers to work more efficiently. EDI will cover all travel, meal and lodging expenses for 10 attendees. Those individuals with with some experience in R or Python and an interest in writing new code or contributing to existing code in the Registry are invited to apply here by 3/31. Questions? Contact info@environmentaldatainitiative.org. FSCI is a week-long program of coursework, group activities, and hands-on training around the latest trends in scholarly communication to be held Aug. 5th-9th, 2019 in Los Angeles, CA. Courses feature the latest technologies in research flow, new forms of publication, current standards and expectations, and explores ways of measuring and demonstrating success that are transforming science and scholarship. Who should attend? Researchers, librarians, publishers, university and research administration, funders, students, and post docs from across the sciences, social sciences, and the humanities. Learn more, register, and apply for travel assistance here. ApacheConNA will be September 9-13, 2019 in Las Vegas, Nevada, USA. Submit presentations now here to the Geospatial Track, which will consider a range of geospatial implementations ranging from location as an attribute, to projects which perform spatial analytics including handling of coordinate reference systems (CRSs), geometries and arrays. Emphasis is invited on the use of open standards including the recently updated CRS Well Known Text, version 2 from the Open Geospatial Consortium (OGC). The geospatial track will foster discussions leading to reduced development effort through reuse and increased quality of geospatial information handling. Discussions about this track are invited on geospatial@apache.org. View the solicitation here. Notices of Intent are due by 4/3. As part of a grant from the Sloan Foundation, the IGSN 2040 Team is looking to engage researchers across disciplines and across the globe through a survey on physical sample and sample collection digital management. The survey will be used for the development of services, tools, and documentation related to the management of samples. In particular, the team is interested in the use of unique identifiers, such as IGSNs to manage samples. You do not need to be familiar with IGSNs to complete this survey. You can take the <15 minute survey here before March 28th. As part of the GOES-R Education Proving Ground, the Cooperative Institute for Meteorological Satellite Studies (CIMSS) is holding a Virtual Science Fair to encourage students (grades 6-14) to work with GOES-16 or GOES-17 data to investigate weather and natural hazards. Prizes include official GOES-T launch invites and coaches of the winning teams will have their travel paid to AMS Centennial meeting. Learn more and apply here by 5/3. Network and establish relationships with others doing similar work. ESIP Staff, along with several ESIP Lab teams, were able to take part in a previous SGCI Bootcamp and found the experience to be extremely valuable. Learn more and apply by 3/29 here. You are receiving this note because you are subscribed to one of the ESIP list-servs.